Both of these grip strength exercises work to create a contracting, crushing grip. By cutting wire and using pliers to lift weight, you'll make your hands tons tougher. And, of course, stronger. Always start slowly to get the best results. Hands are important, and you can certainly get a great workout from these exercises, but just be careful not to hurt yourself when you're starting out. I got these 2 grip strength exercises from John Brookfield's Mastery of Hand Strength. An awesome book by an amazing guy, I highly recommend it if you want more info on grip strength training. This is one of the most effective grip strength exercises for building a crushing grip. If you've cut wire before, this it might seem a little weird - but bear with me. The idea is to get a pair of small wire cutters to work with. Not big ones that will make the cutting easy, but small ones that force you to really crush to cut the wire. Try using regular fence wire at your local hardware store at first. If you can, try cutting some in the store to make sure it's difficult, but not too difficult, to cut the wire. Once you've found a gauge of wire that works, buy a spool. It'll be pretty cheap. Then take it home and start cutting. Cut about 1 inch lengths of the wire, and just keep cutting until your hand's tired. This should be a crushing movement. Use a bucket to catch the cut wire so it doesn't give someone a nasty surprise when they're walking around. You can throw out those pieces, or see if you can get one more cut out of them. Make sure that you change hands when you're doing this. One strong hand is great, but a pair of strong hands is better. To make it harder you can start doubling up the wire (or even triple up eventually). 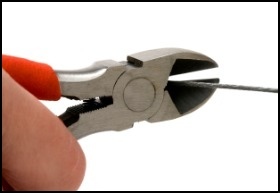 Or just get thicker wire, smaller wire cutters, or use only 2 -3 fingers. Keep it interesting, and keep making it gradually harder. This is a similar grip exercise for creating a tight, static crushing grip. Again - deceptively cheap and simple, but boy will it work your forearms. Take the bucket and put some weight in it. Then wrap the strip of leather just around the bucket's handle and grab the two ends of the leather with the head of the pliers. Then, with a thumb upward grip, simply lift up the bucket while holding the pliers tightly pressed together. If you don't keep the pliers tight, the leather strip will loosen and bucket will fall - so keep it tight! Once you've lifted the bucket, try doing some hammer curls with it. This will place a great strain on your grip and forearm, especially your lower forearm. As you get more advanced, get another strip of leather and pair of pliers. Then, wrap the two strips around a regular barbell and do hammer curls or deadlifts with both hands. Or just do two buckets at the same time. One Caveat: Make sure the leather is strong. You can substitute canvas or some other cloth for it if necessary, but make sure it can take the strain without breaking. Use these grip strength exercises to build strong hands, but don't neglect the rest of your body. Strong hands are useful, but connecting them to a strong body will make them amazing! • Click here to leave 'Great Grip Strength Exercises' & go back to the Complete Strength Training Home-page! 1. Brookfield, John. 1995. Mastery of Hand Strength. Nevada City, Calif: IronMind Enterprises. Pp. 21. 3. Ibid. Pp. 21 - 22.